Despite the resistance of many whites, the recruitment of African Americans into military service proceeded at an almost breathless pace, which produced a new administrative weight that quickly overwhelmed the Adjutant General's Office. Queries for information, requests for appointments to recruit and serve in these new units, mountains of paperwork for enlistees, and orders to organize and equip these commands began to suffocate its personnel in an avalanche of documents. To compound these problems, black regiments required special consideration. The Federal government placed unusual demands on its officers and men and more carefully supervised the recruitment process. In the North, state governments had a hand in the creation of new regiments. Most of the black units, however, would have ex-slaves as their enlistees, and they would come predominantly from seceding states. The Federal government would direct the recruitment of those black units. By mid-1863, the administrative load became so burdensome that the War Department decided to create a single entity under the umbrella of the Adjutant General's Office, called the Bureau of Colored Troops, to manage its affairs. Headed by Major Charles W. Foster, the bureau was to systematize the process of raising black units and securing officers for them. It also served as a clearinghouse of information on these units. Over the course of the next year, the War Department began to change the names of black commands. 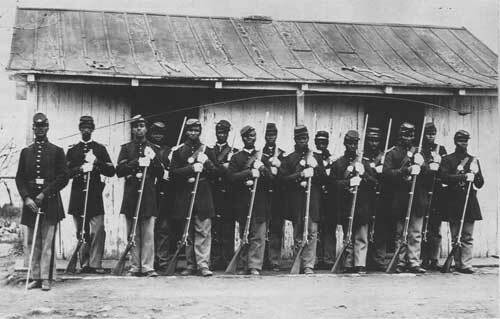 Instead of state designations, they became United States Colored Troops (USCT), and the various units became United States Colored Infantry, Artillery, or Cavalry. Of all the black regiments, only the 54th Massachusetts Infantry, 55th Massachusetts Infantry, 5th Massachusetts Cavalry, and 29th Connecticut Infantry retained their original state designations. With Foster at the helm, the Bureau of Colored Troops administered more than 186,000 black and white officers and men during the war. At one time the Bureau of Colored Troops had over 123,000 soldiers in uniform, a force larger than the field armies that either Lieutenant General Ulysses S. Grant or Major General William T. Sherman directly oversaw at the height of their campaigns in 1864 and 1865. THIS ILLUSTRATION FROM HARPER'S WEEKLY SHOWS A UNION OFFICER TEACHING RECRUITS HOW TO USE THEIR RIFLES. 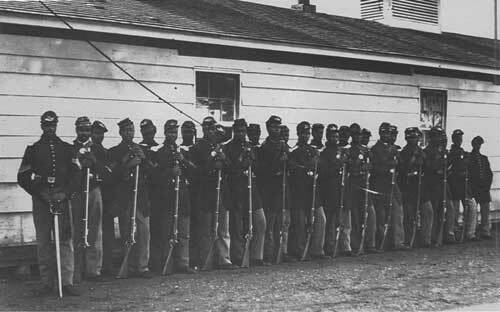 Because of the controversial nature of black military service, the Lincoln administration determined that whites should officer the new black regiments. 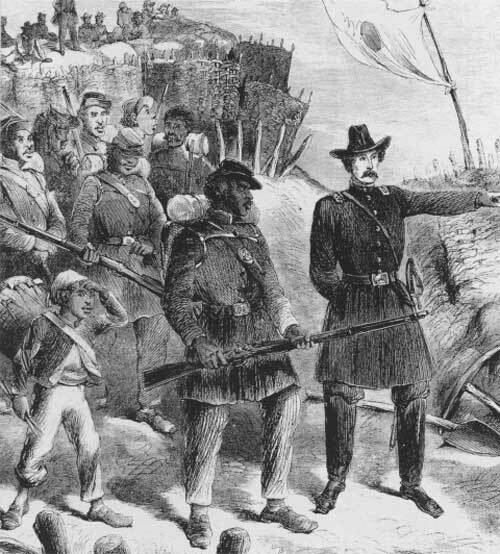 Those black officers in the Native Guards could stay, although Banks intentionally drove them all out of the army by early 1864. In selected cases, the War Department would permit them to serve as chaplains and surgeons. Otherwise, African Americans were barred from the officers' ranks. By offering commissions to whites, the War Department hoped to appease objectors in and out of the army. Those whites who endorsed the concept of black military service and assisted in its execution could gain commissions or promotions to higher rank. Individuals who opposed the formation of black regiments received reassurance that they would not hold commissioned rank over white enlisted men. In short, whites would remain in charge. Racial stereotypes, too, played an important role in the decision to dole out commissions only to whites. Since most white Northerners doubted that black men had the innate ability to fight well and believed that their inferior character would prevent them from becoming good soldiers, these new black regiments would require committed and talented white officers to train and lead them. The Federal government decided to screen prospective officers carefully. Some were individuals whom prominent politicians knew to be sympathetic toward black people, and they received direct commissions. But the rapid expansion of black units in the latter half of 1863 and throughout 1864 and the ensuing demand for white officers compelled the government to devise more efficient ways of selecting officers. The problem was that there was no sure-fire method to determine an individual's capacity for leadership and his attitudes toward African Americans. The best the government could do was to seek out moral white men with military knowledge who also had a liberal arts background, which reflected a more well-rounded individual. By mid-1863, the Adjutant General's Office established boards to certify the qualifications of prospective officers. While many officers in the USCT were political appointees, a majority passed an examination. This ensured a degree of selectivity and competence among officers of black units that did not exist in white regiments. Most officers of white troops obtained their commissions through political contacts or election by their comrades. They learned on the job. Nearly all officers in the USCT assumed command with knowledge of their duties, which unquestionably facilitated the development of those units. Some viewed service in the USCT as an extension of their prewar antislavery activities; others joined because they wanted to uplift the black race. Some coveted commissions in the USCT exclusively for the increase in pay and rank. They had no real interest in leading black soldiers in battle. Many of its officers, after fighting a couple of years in white units, entered the USCT because they felt this was the best way they could contribute to the Union war effort. As veterans, they could teach others what they had learned during active service. More important than any motive or quality, though, was the fact that nine of every ten of them had at least some combat experience. They had "seen the elephant" and knew how to prepare recruits for the hazards and chaos of a battlefield.